Watch our video and then click the button above to learn which software is the best fit for your Small Business. First and foremost, there is no such thing as a "DCAA approved" software package, software systems, or companies. That is a misnomer. There are only DCAA compliant accounting systems. These systems are designed to meet all the FAR, CFR, GAAP and DCAA requirements. There are also ways to make an accounting program that is not designed for DCAA compliance, actually compliant. This usually requires some "add on" features and/or programs to make the system compliant. In our 20+ years of Federal Government/DCAA compliant accounting and contract management, we've had extensive experience working with different accounting and timekeeping software and systems. As an independent expert, and not a biased re-seller of software, ReliAscent® can help you identify the best systems for your small to medium-sized business. A common mistake we routinely see is contractors that have over 50 employees with multiple government awards, still relying on QuickBooks® to do their accounting. QuickBooks can provide value for smaller companies but as the company grows it can stretch thin in the areas of Inventory, Internal Controls, ERP, GAAP compliance and quick turnaround of useful information for project managers. At this point there are a number of better systems that do not pose the same compliance risks and can save you time and protect your bottom line in the future. Conversely, many smaller contractors unwittingly find themselves using software that is overly expensive and complicated for the level of contracting they perform. Generally speaking, there are three types of software used for compliance to government/DCAA requirements. These groups of software, generally speaking, increase in price as you progress up the pyramid and internalize features required for government accounting. Also, the number of options in software tend to decrease as you progress up the pyramid as well. 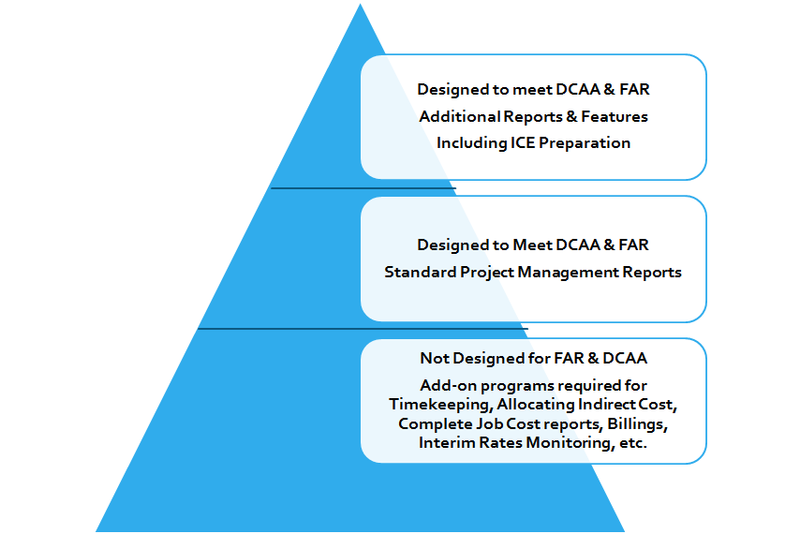 Some of the industry standards (like Deltek Costpoint® for example) tend to be at the top level in this pyramid but also at the higher levels of pricing as well. Whether your company has 1 employee or 500; whether you have 1 contract or 50, ReliAscent® can help you identify and implement the best systems to keep you in compliance, increase profits and protect your bottom line. ReliAscent® can help you identify features that are important to your company and costs for achieving those types of features and benefits. There very easily could be some trade offs that you should evaluate prior to purchasing a system. ReliAscent® has some tools that have been in use for over 20 years and passed hundreds of DCAA audits. The tools use data from the QuickBooks® file to calculate indirect rates and job cost reports in a format that the Federal Government likes to see. ICAT™ is a well known, commercially-available add-on to QuickBooks® that can make a QuickBooks® system compliant with DCAA requirements. eFAACT® is a well known, commercially available add-on to QuickBooks® that can make a QuickBooks® system compliant with DCAA requirements. ReliAscent® is a partner with TBS LLC. The TBS ClaritasSM/QuickBooks® program allows the company to use a QuickBooks® based General Ledger program and the ClaritasSM program pulls accounting data from the QuickBooks® file to calculate Government Indirect Rates, prepare job cost reports and other features. ReliAscent® has worked with Peachtree® systems (now SAGE 50 Accounting®). This program is very similar to QuickBooks® and requires add-on programs to make a compliant system. The Microsoft Dynamics GPTM software is not specifically designed to meet FAR and DCAA requirements out of the box. To make such a system compliant requires the use of additional add-on programs. ReliAscent® is a partner with Global Systems Technology Inc (GST), the company that makes the ERP-GOV™ software. This software package is specifically designed for small to medium sized businesses and is DCAA compliant out of the box. This is the Microsoft product that is DCAA compliant out of the box. This system also has the capability of a full inventory and ERP system add-on module. The program is flexible and can meet the needs of any sized business. Jamis® software is designed to be DCAA compliant and can make a compliant system right out of the box. Deltek Costpoint® software is the "gold standard" for accounting software for large corporations dealing with the Federal Government. They also market a similar system called Deltek First Essentials® (the former Deltek GCS®)software which is a SaaS program designed for mid-sized firms down to small firms. ReliAscent has several people experienced not only in system operations & set-up but in installation of the systems. Tech BizSolutions, one of the forming partners of ReliAscent®, was a Deltek Partner for many years prior to the merger that created ReliAscent. Call ReliAscent® today and discuss with us the needs for your company. We can help you sort through the features and benefits of the various choices to help you make a decision that is right for your company. We like to help companies make choices that "fit" their company rather than try to make "one size fit all". Download your copy of "The Top 15 Signs Your Accounting System May Not Be DCAA Compliant"